~Our love story starts way back on June 3, 2006. That's the day I became his girlfriend. Mitch and I were really great friends. We had always been in the same friend group, but never noticed each other, other than just.. mutual friends. Mitch and I grew up just down the street from each other. We've "known" of each other since we were 10 years old. But like I said, we just knew of each other way back then. Eventually as we entered high school we saw other people, until we crossed paths again at a youth group activity. We decided to be partners that day and have been connected at the hip ever since! The things that caught my eye about him that peticular day was his humor, kindness, quiet misteriousness and just how fun he was to be around! I loved spending every minute with him, and I still do. We have so many amazing memories together and so many big things we got to experience, together! (Driving, First Kiss, Graduating, College, etc.) We dated for a little over 3 years before getting engaged on November 6, 2009. That was the 2nd best day of my life! I have never been happier. I believe having a good friend in each other is what helps make your relationship succeed. 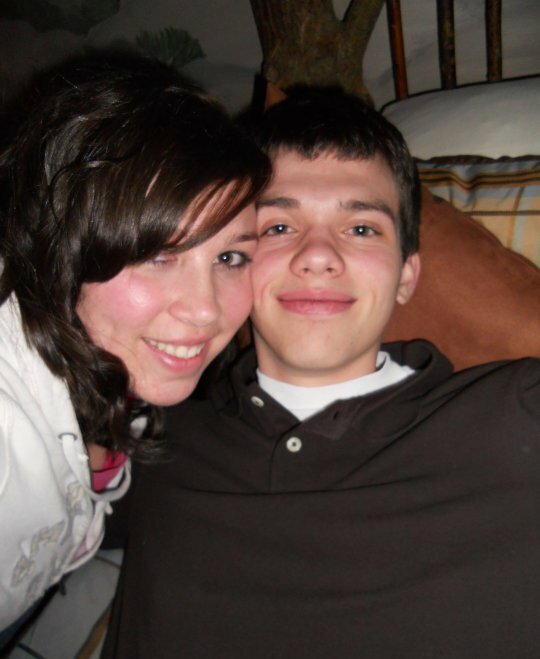 We have always been good friends and I couldn't ask for a better one :) I love him so so much! He is my everything.